Together, we can make Michigan a "Top Ten" state! When it comes to our state’s economy, we need to go full throttle. Thanks to policymakers, business and community groups, citizens and stakeholders, the state has advanced in meaningful ways. We can see the results in the form of new jobs and higher incomes. But our work is not done. Michigan is ready for fresh, bold strategies that propel us even further into economic vitality. We must unite behind an updated agenda for strength, results, and innovation that will help us outperform our competitors in other states and nations. At Business Leaders for Michigan, we are committed to helping accelerate our state’s growth. 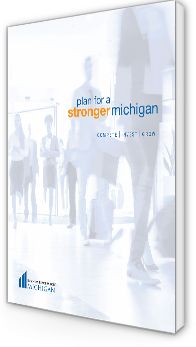 The Plan for a Stronger Michigan, which pulls from our original Michigan Turnaround Plan, continues to have a goal of making Michigan a “Top Ten” state for jobs, personal incomes and a healthy economy. It reflects the gains we’ve made as a state, as well as challenges on the horizon. Prosperity is possible for all of us. Let’s work together to make it happen.